In London’s prestigious Brompton Academy, new student John Watson (Alan Cox) meets the eccentric but brilliant classmate Sherlock Holmes (Nicholas Rowe). When they discover a string of mysterious deaths – including the suicide of Holmes’ mentor Rupert Waxflatter – they launch their own investigation. Before long they are neck-deep in chases, sword fights and intrigue as a mysterious Egyptian cult is discovered beneath the city streets. The mid-1980s saw Steven Spielberg’s production company Amblin Entertainment in an enviable position in Hollywood. Between 1984 and 1990, Amblin produced 15 separate family-oriented productions across several studios and genres. Some became huge commercial hits, including Back to the Future, Gremlins, and Who Framed Roger Rabbit?. Other became nostalgic cult hits, including The Goonies and Arachnophobia. Then there are the films that simply fell flat, failing to develop an audience at the time or in subsequent decades. 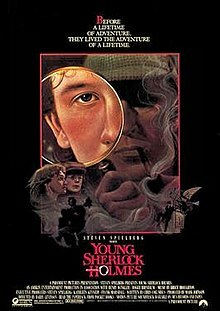 Young Sherlock Holmes, directed for Amblin by Barry Levinson, is as good a poster child for those failures as any. The weird thing is that an adventure film starring a teenage Holmes and Watson is not actually so terrible an idea. The Victorian London setting is atmospheric and evocative, while the fresh angle on old characters gives it the potential to make it relevant to a contemporary audience. Throw in a reborn Egyptian cult operating beneath London’s streets, and a string of murders involving hallucinogenic fantasy sequences, and the framework is there for a solidly entertaining movie. The film also does not fail at the hands of its cast. While neither is truly exceptional, both Nicholas Rowe and Alan Cox acquit themselves well enough as the high school Holmes and Watson. Sophie Ward is an earnest and likeable Elizabeth – Holmes’ love interest. A range of dependable British actors provide good supporting backup, including Anthony Higgins, Nigel Terry, Patrick Newell and Freddy Jones. Bruce Broughton delivers a strong musical score, albeit one very heavily influenced by Amblin’s signature John Williams-esque sound. The production values are relatively strong, particularly in terms of visual effects. Strong stop-motion animation is used for several sequences, but the real stand-out – and a legitimate reason to watch Young Sherlock Holmes at least once – is a ground-breaking CGI sequence in which a stained glass knight leaps from a church window to menace a priest. The effect was supervised by John Lasseter and Pixar Animation, then still owned by George Lucas, and was the first-ever photo-realistic character to be incorporated into a live-action feature film. Those are the film’s assets, but what manages to transform it into a failure? For one thing, the action is constantly hampered by an unnecessary narration by noted British actor Michael Hordern, playing an older Watson looking back at his first adventure. It is not simply intrusive; it is overly descriptive. Actions that are self-evident on the screen are described simultaneously, as if the production assumed the audience was comprised of idiots. Moments that would have strengthened the drama by playing out are regularly hand-waved away by the older Watson’s nostalgic ramblings. That is a significant irritation, but the death blow comes from Barry Levinson’s leaden direction. At the time of helming Young Sherlock Holmes, Levinson had directed two films: Diner and The Natural. Both excellent productions, but neither of them demonstrating the sort of pace and energy required to sustain an edge-of-one’s-seat action-adventure. The truth is that Young Sherlock Holmes drags terribly. Its rhythms are all out of whack. The action, when it comes, is not shot in a suspenseful for engaging manner. Levinson has much strength as both writer and director; action and suspense are not among his stronger skills. While the film is ultimately pedestrian, the potential of the concept remains. I would not be averse to another production team revisiting the ‘young Sherlock’ concept and giving it a second attempt; this time with some proper momentum and energy behind the camera.